Showcase your TV with the elegance of this Louis Philippe inspired 54-inch TV console. 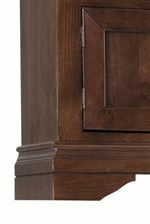 Traditional top molding and classic bracket feet add distinction to this console's design. Two wood doors and two glass doors are framed with simple trim to add style to its storage. Two compartments at the top of the unit are ideal for electronic components. 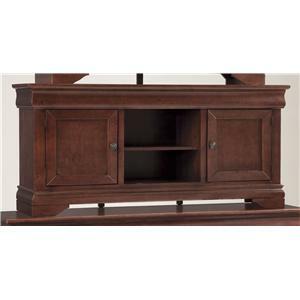 The Coventry Louis Philippe 54" Console by Progressive Furniture at VanDrie Home Furnishings in the Cadillac, Traverse City, Big Rapids, Houghton Lake and Northern Michigan area. Product availability may vary. Contact us for the most current availability on this product. The Coventry entertainment collection features Louis Philippe design for a timeless look. The Auburn cherry finish is effortlessly sophisticated for a great look in a transitional to traditional decor. 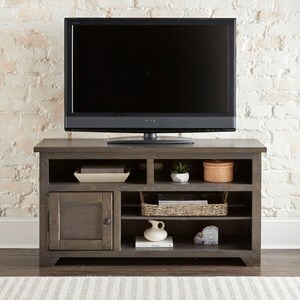 Choose from three different sizes, all with maximized storage space for your entertainment needs. The Coventry collection is a great option if you are looking for Traditional furniture in the Cadillac, Traverse City, Big Rapids, Houghton Lake and Northern Michigan area. 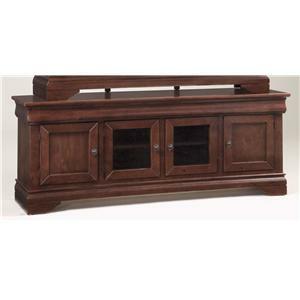 Browse other items in the Coventry collection from VanDrie Home Furnishings in the Cadillac, Traverse City, Big Rapids, Houghton Lake and Northern Michigan area.